Cars And Coffee Car Show at Westport Plaza. Join other car enthusiasts by bringing your classic, exotic, hotrod, muscle, domestic or modern car or truck to show off at Westport Plaza on the third Saturday of each month, April through October. These events are FREE for participants and spectators; kid and pet friendly, too. See their calendar website for more details and the other car show venues. Westport Plaza features a wide variety of restaurants, night spots, entertainment venues, specialty shops and two first-class Sheraton hotels. 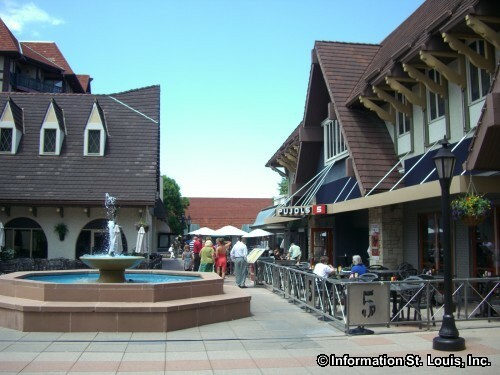 Westport Plaza has an Old World Village feel with Tudor-style architecture, open courtyards and walkways. Many restaurants have outdoor dining and during warmer months patrons will enjoy the events that are held in the courtyards or on the parking lots of the Plaza. Many special events, such as "Parties In The Plaza", concerts, as well as many different "Street Entertainers" are at the Plaza throughout the year. Directions: Located in Maryland Heights on Westport Plaza Drive, near the intersection of Interstate 270 and Page Avenue. Take Dorsett Road, just east of I-270 to south onto Investment Drive, enter roundabout and take first right onto Progress Parkway to Westport Plaza Drive. Cross over to the Plaza which is straight ahead.